– April style of play is to be moving when the ball is contacted on serve, similar to what some tennis players do. – You will notice there are some spacing issues on this attack. It seems like April was expecting a more up and down set in the middle while Kerri was expecting April to make a little more space and take the set in an area. 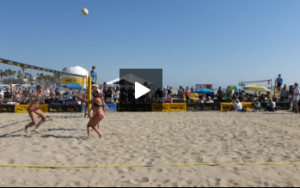 – Notice Kerri form on setting, the right foot is forward, she is square to her target, and she gives a strong call after the ball is set.